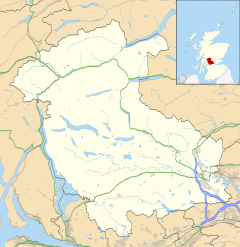 Deanston (Scottish Gaelic: Baile an Deadhain) is a village in the Stirling council area, Scotland, on the south bank of the River Teith east of Doune, in south-west Perthshire. It is a part of the parish of Kilmadock. The name comes from Walter Drummond, Dean of Dunblane in 1500, originally called Deans Town. After his appointment as Dean of Dunblane, he acquired the lands now known as Deanston from the Haldanes of Gleneagles. Deanston Cotton Mill was built by the Buchanan brothers of Carston, Killearn near Glasgow, in 1785, and utilised the River Teith to power the mill. In 1808 James Finlay & Co bought the mill and developed it into the industrial leader of its time, which included the construction of a 1500 yard long Lade. a manager of the mill, was a successful entrepreneur and inventor. He built unusually designed accommodation over four levels for his workforce, called the divisions, which was new in its day. At its peak, the mill had over 1000 workers and had the largest waterwheel in Europe, Hercules. The cotton mill closed in 1965. On the site, the Deanston Distillery opened in 1966 and is owned by Burn Stewart Distillers Limited (part of Distell Group Limited), where it produces several megawatts for the National Grid (2007). Oddly as a small village Deanston links to two Lord Provosts of Glasgow: Sir John Muir and Sir David Richmond. Deanston is the birthplace of pioneering documentary maker John Grierson after whom a street in the village is named. James Tod of Deanston WS FRSE laird of Deanston from around 1830 to 1858. ^ MacKay, Moray S.(1953). Doune Historical Notes, p. 44. Forth Naturalist and Historian Board ISBN 0950696250. Wikimedia Commons has media related to Deanston. This page was last edited on 17 December 2018, at 21:44 (UTC).